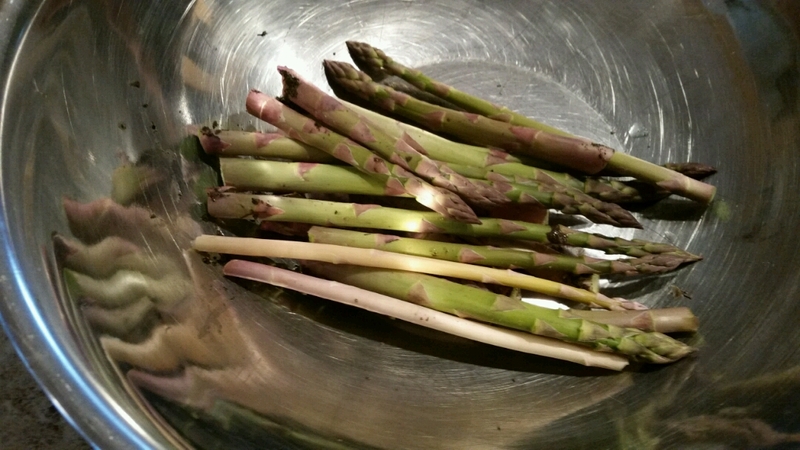 After throwing together a tuna noodle casserole and trying to eat some (everything rather tastes like cardboard right now) I went outside in the dark dank day and checked on the asparagus. The husband was right on in his estimation of when it would be ready to cut and he even cut it. Looks like enough to have for dinner tonight. I can enjoy it all myself as he plays pool tonight so am hoping I'll be able to taste it. I'm tired today, still coughing, day 2 with no fever. Recovery seems slow, but so it goes. I shouldn't complain as I have so many other blessings. Shame on me. Life, I can never get it right; but that's what comes from being a perfectionist. We had a wild thunderstorm right at dawn this morning, a great light show and some very hard rain. Though it took its time getting here the sky water is washing us clean right now. Our dog is 6 years old. For the the first 5 years of her life she was never freaked out by thunderstorms; then she was. I have no idea what changed, but I wish it hadn't. Though she doesn't run around all crazy as I have read some dogs do, she does want to den up under the table at the end of the couch.Today, she proceeded to perform this maneuver and laid down on top of my laptop. She is not a small dog, don't know how she manages to get under there. I removed the laptop as it seemed an uncomfortable pillow to lie on especially when she was stressed. She panted and drooled for an interminable amount of time and final wore herself out and went to sleep. I've read about the thundercoats, but have yet to feel driven to buy one. Wonder if anyone has ever gone that route. I'm terribly nervous today, cabin fever? recovery frustration? If I hadn't already cleaned up, I'd take a long hot bath, but the thought of getting undressed is too much. I am so tired. Enjoy asparagus season! (I'm envious, we have to wait half a year & survive winter first).